History of Philosophy--Ancient History (B.C - 14th century): Dr. Greg Bahnsen's excellent series lecturing through Ancient Philosophy in 24 parts with reference to Frederick Charles Copleston's famous History of Philosophy text. Here is a great way to gain the background in philosophy which you have wanted but never had the time to get. 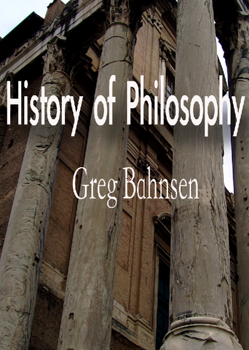 In a course at Christ College Dr. Bahnsen discusses the history of philosophical development from biblical times, through ancient Greece and into the Middle Ages. Understand the antithesis between Christianity and the world (even in our culture today), as well as the crucial setting for the introduction of Christianity and its early development in the world of thought. Also helpful for deepening your understanding of issues in apologetics. See also Renaissance History and Modern History.